Welcome back to Inside the Mind of an NYC VC, a new series at AlleyWatch in which we speak with New York City-based Venture Capitalists. In the hot seat this time is Vanessa Pestritto, Partner at Lattice Ventures, an early stage venture firm. Vanessa stopped in to talk about her transition from New York Angels to Lattice Ventures, VC firm scalability, and much more. Tell us about your journey into the venture business and how you came to found Lattice Ventures? My journey began by going to startup events and seeing pitches, in 2011. I enjoyed it and I was interested in all the new tech I was seeing. So I figured I should go to a startup. I left my job and wanted to enjoy the holidays, but that didn’t last very long because I was introduced to Brian Cohen, who had just been named Chairman of New York Angels. He was looking for an Executive Director. I sent him my resume, we met for dinner – in fact, I was the first person he met – and that was it. By then I had integrated myself into the scene, I was going to numerous events, and so it was a natural transition when I started working at New York Angels in January 2012. I did that for four years. It was an exciting role. It encompassed many moving parts, including: the deal flow management piece; investor experience; mapping interests of investors to the right companies as well as overseeing membership recruitment and retention, and all of the marketing that goes along with that; being in charge of community partnerships with accelerators, incubators, universities, other VC funds and angel groups. It was a big role, a fun role, and I was comfortable doing it. I was also the first line for reviewing all companies that applied to New York Angels, and I took numerous meetings with companies. It was intense and I continued to build out my network and reputation as I worked to ensure there was alignment with the entrepreneurs that were coming to us. Several years passed and I was deciding what to do next. I’d already had my first child, and I was meeting with different funds and organizations in the venture space. I had decided that I should make sure I go somewhere where my resources would be utilized and it would be somewhere I could continue to grow my talent. Those two bars were really hard to meet. Finding a place where you want to grow and where you have alignment of how you see the world is very challenging in venture – and very important in venture, because you want to believe in what you’re investing in. Brittany Laughlin, who was at Union Square Ventures, and I had been working together for 18 months on a founders breakfast series, called Gladiators Club. We would hold events once a month, and we found in that process that we really enjoyed working together. We kept it private, there was no public website; it was essentially a way to help provide resources to high-potential founders who were going from Seed to Series A, with some founders who were raising their first Seed round. We kept it small, we kept it intimate, and we kept the content of high quality; there was also a very strong peer-to-peer mentoring component. My baby at the time was about 4 months old, so I had to think about it. After making many considerations, I told her in February that we should do it, but let me pitch a few people first – so I did, and they said yes they would invest in my fund if I launched one. I put in my notice in March and that’s how I became a founder at Lattice. How do the sorts of deals you work on at Lattice differ from your previous experience at NY Angels? It’s very different. From a stage perspective it’s the same stage, but from a review perspective, my role at New York Angels was to be objective, because it’s the members who elect what gets funded. For that reason we were industry agnostic there, barring major energy projects and medical devices, though we did look at the latter from time to time. My job was to have the wide lens and see and evaluate everything with them. With Lattice we have our thesis – because we believe in having a thesis and being disciplined – our thesis is investing in network effect tech businesses in low-tech markets or in new markets. We also have some themes that tie around our thesis as well, including labor as a whole sector. That can mean marketplaces for work; it can mean aggregating or finding communities for professionals and what can be leveraged there. It can mean how AI can enhance professionals to the point they become superhumans. Another area of interest in labor is around general wealth and job functions. When you’re employed by someone you have everything covered for you: health benefits and 401k. When you become an independent contractor, your whole life changes. You get this tax burden and all these other hurdles; so we look for services that can better service the growing 1099 full time work force. We’re very interested in that. Our other interest is wealth creation and retention for everyone. There are numerous, numerous apps that are targeting millennials, for instance. Some are great and some die quickly. There’s a lot of money on the table – America’s huge, so we really have a wide lens on that as well. The benefits piece of the 1099 worker that I mentioned earlier also ties into that wealth aspect, because they’re dependent on each other. We’re also interested in marketplaces that are in these sleepy spaces. It can be in wholesale-to-retail, it can be in transportation and logistics – as long as there’s a niche opportunity and there’s network effects by which a business can protect itself when it’s getting launched, then we’ll look at it. I’m always interested in the etymology of a firm’s investment thesis; where did your thesis come from? In working together on the breakfast series, we were often in a position where founders would tell us what they were having challenges with in the marketplace when trying to fundraise, and we each would give our own set of advice. I was at the Seed stage and had a very different lens given my work with angels, and Brittany was at a top Series A firm, so she could say what a Seed company should be targeting in order to think about fundraising down the line. In doing our respective jobs we realized what was important for each of us in investing in a company. Now, there are great businesses out there that don’t fit our thesis: if you want to build a subscription box company and you have your audience and the economics are fantastic, then go build that business. However, we know what investment is required for that business to grow, and where the money is going to be deployed. For us as investors, it’s not as exciting as what network effects companies can do. Our personal experiences reviewing deal flow informed our perspectives. For me at New York Angels, I would see different companies and I just couldn’t get as excited about them unless I could see how the tech would protect itself. As for Brittany, she had already built and sold a company prior to launching Lattice, and had learned a lot from that experience. 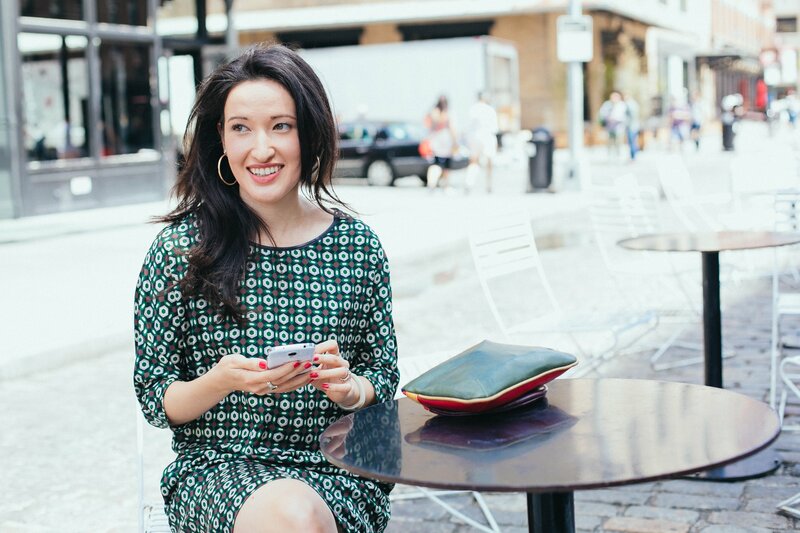 She had also started a second company, which she rolled into a non-profit, so when she started at Union Square Ventures she already had the lens of the entrepreneur and a perspective on different business models. Then after she joined USV she got the investor’s lens – especially from a network effects perspective because that’s part of the thesis there as well. Her experience at Union Square Ventures sort of confirmed all of our realizations, and it gave her hands-on experience with executing on that type of strategy as well as with working alongside network effects companies. Once you’ve identified a company that matches your thesis, what do you look for in a founding team? And what mistakes do you see founders make or what traps do they fall into when they pitch you? I don’t think people fall into traps. I’m pretty helpful to people who come in to pitch us. Something Brittany and I talk about a lot is, when you’re in the tech bubble, there’s certain phrases and ways to sell yourself and ways to accelerate conversations that a lot of people don’t have access to, which I don’t think should be held against them. If you don’t come from the tech space but you’re building a company and you’ve found a market and you’re growing it really well, I will sit with you, the founder, and get whatever’s in your head out. I’ll sit with them, hear what they have to say, pull out the important things, reshuffle it, and tell them the things we really care about as investors and what they should make a point of telling other investors first. In general, any traps or missteps a founder makes are fine as long as I can get whatever is in their heads out and as long as they’re smart and have talent and there’s growth and you can see that everything else is aligned. And I’m more than happy to do what I can to help them accelerate along the way; I’ll do sessions with them to help them hone their pitch. As a Seed stage investor you have to know people early. When you have someone who’s had their head down in their apartment for a year working on their product and they’re just starting to emerge, they might not have all the language perfected yet so I try to help them along with it. If you put in that time, whenever they’re ready to fundraise they’ll come to you first, so there’s a longer-term investment opportunity that I see in putting in that time. In general I dislike inefficiency enormously, so when I see someone talented saying the wrong things and I know they’re going around pitching everywhere and I know they’re going to get passed on for the wrong reasons, because they weren’t saying the right things, I just think that’s a major disservice to the market in general. Has the investor community as a whole gotten more receptive to hearing from entrepreneurs with untraditional backgrounds or who might not know the in-group lingo, or is that barrier still very high and difficult to eclipse? I’m a big data person and I don’t have the data on this, but I still think it needs to be worked on in the market. If not, I wouldn’t be seeing all these people like I just described – although in fairness, I am the first meeting for a lot of people, given our stage. What I could say is that from five years ago, as with most things in life, there’s more information out there. People are producing more content, they’re putting more information out there about what it is they’re looking for. For their part, investors will say what they’re excited about; if you pitch them something completely off the mark, they’ll say, “you don’t even follow me” – which, fine, I get it, but I also think there’s not enough recognition that these people, these founders, are busy. No doubt about it, I’m busy as a VC. I have my investments, I’ve got deals I’m working on that I’m finally going to land in the next month or two, I’ve got new inbound I’m dealing with, and so the number of plates you’re spinning gets to be a lot – I get that. But it’s also our job and we signed up for it and you have to do what you have to do. Whereas for entrepreneurs, yes, you signed up for a job, and yes you’re going to fundraise, but even people starting and running companies are humans, too. I care more about what’s in their head. I don’t think passing on someone because they don’t know everything about my firm is a valid reason. You said you were a big data person – are there particular metrics you look for or are there certain marks a company needs to hit in order for you to invest in them? Because we invest so early it really depends on what they’re building and what they have out of the gate. If it’s a product, if it’s something very technically challenging, then vetting that would be more important than revenue. If it’s something that has a slightly lower bar on tech but would have a differentiator on network or community, then we’d want to see what progress has been made on that side and understand what nerve the company’s hitting – it’s much more product-value-based. The economics I would look at for each company would be more on the potential side than what they have today, because that’s how you measure the value of what they’ll be able to create down the line. You’ve been in the New York entrepreneurial community since the beginning of the decade. How has the scene here evolved in that time? I think about that a lot, because I remember in 2012 people would ask me, “What event should I go to?” In 2012 I was still new enough to know which events to go to. As I’ve grown up in the space, I rarely go to public events anymore. After about a year I started to get invited to and go to more private events. That happened organically; the more people I helped or referred things to or accelerated along their path, which helped me build my reputation and got me to a point where I was invited into those private events. As far as how the scene itself is different, I think that for sure there are a lot more tech people and companies than there were in 2012. I’ll walk on the street and I’ll recognize more people today from different events or communities, and that’s a signal of a growing ecosystem. How does venture capital as an industry need to evolve, or where can it improve, in your opinion? We look at it in a few ways. When you raise a fund, you make your investments and you have to nurture those investments as they grow up. You help them along the way, you help them raise capital, you work with others as more investors come in, you collaborate, etc. Managing those relationships is very important. 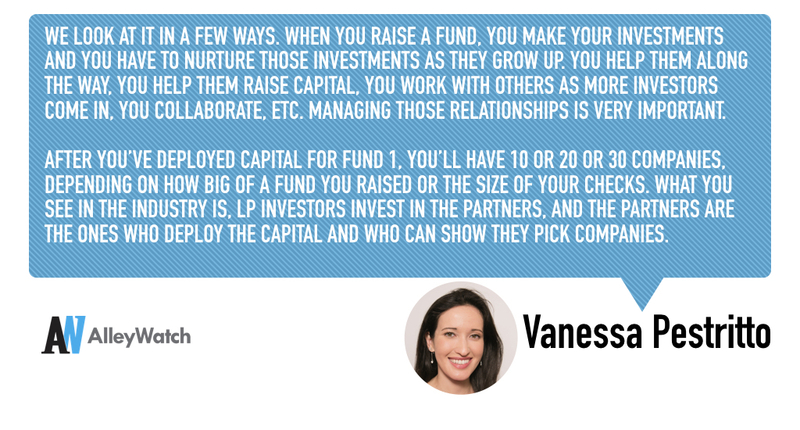 After you’ve deployed capital for Fund 1, you’ll have 10 or 20 or 30 companies, depending on how big of a fund you raised or the size of your checks. What you see in the industry is, LP investors invest in the partners, and the partners are the ones who deploy the capital and who can show they pick companies. Time goes by and then those partners raise another fund, and it’s slightly bigger or the same as the last fund and they have the same responsibility again: they have to select companies. They’ve proven they can pick companies, and they’ve proven they can work well with companies, so now they have some sort of edge and they have a much larger portfolio to deal with. Granted, some of their companies will die along the way, but on the whole it’s more and more. So then it comes time for Fund 3 and the partners have all of this responsibility – which poses the question: how do you start scaling VC? That’s the question my partner and I are thinking about: what does scalability look like in VC? In general, what other funds have done is they bring on a new partner. When you do that you have to share with your current investors that there’s alignment here. You have to tell them the things they bring to the table that are complementary, and you have to assure your LPs that the new partner will pick alongside the existing partners. So that’s how it’s been done historically. From a tech perspective, you can’t help but think, “really? That’s how you scale?” We’re thinking about that; that’s one of the inefficiencies in the market. Beyond that, I think the tech industry could be better served by investors and entrepreneurs that look more like the people they’re building for. America is big; not everyone in America went to the top Ivy League schools, it’s much bigger than that. So how do you fund or get investors of different backgrounds to be able find the big opportunities that are still out there? I want to come back to the Gladiators Club. What compelled you and Brittany to start that series and what did it consist of? Now, maybe it was a brand intimidation thing – you think of USV and some people maybe self-disqualify, they tell themselves they don’t have a shot there and they don’t even try. So Brittany had seen this phenomenon at the Series A level and she asked me what I had seen at the Seed stage, and I said, “I know so many female founders” – as in, all of them, because I was a woman on the Seed stage side and I was managing the top of the funnel at New York Angels. We agreed we didn’t want a Meetup page or a website or anything that would create external pressure. We decided we’d each invite a group of people, keep the attendance to no more than 15 people, and we asked ourselves how it could be effective. We talked about all the things we didn’t like in the market for events targeting women. Being very demanding on the quality level and putting a deadline in place worked for us: we had our first meeting in September 2014, it was well received, it was a good turnout, and we’ve been doing it once a month since then. You’ve been running Lattice Ventures for over a year now – what have been the greatest learnings so far? It’s hard to pick any one thing because you’re learning all the time. I will say – like most entrepreneurs, you’re constantly refining your pitch. When you’re in any role as a founder of a company or fund, refining your pitch means tailoring it for anyone you deal with: for entrepreneurs, investors, partners, friends, etc. It’s always a matter of working on that pitch from all angles. What would your founders say about you as an investor? I think they’d say she tells the truth, that she’s always helpful and resourceful, and she’s very good at introductions. They definitely appreciate my creative and analytical aspects. I met recently with a company and they threw out some target metrics and asked if they looked right to me; so I said, “you have to give me a bit more context.” We went down into the economics of it, which is always a great way to do to things, and we looked at the average order value and measured it against the current and target metrics. The founder liked how we backed into it and they were able to better define the targets for their team. Providing that different perspective and not wasting time – I hate wasting time – is another thing I think my companies would say about me. What trends are you watching closely in 2017? The AI/superhuman of professionals is something we’re interested in. Transportation and logistics in general from a shipping standpoint – as in ships, not just UPS but ships – has become ridiculously popular and enormous, but there’s still so much room for innovation. I think labor is going to have a big shakeup, and there’s going to be a lot of pieces falling out with the new administration and the instability that is coming with it across markets. It’s a great concern but it’s also an opportunity in the way that we can think about, how can you leverage the talent that’s going to be poured into the market and making something of it. There’s interesting developments with machine learning and AI and how different companies are looking at how that can be democratized, in order to build better tech either for themselves or for the markets. We’ve looked at many companies in that space. Things that can democratize tech are always interesting to us. What does the division of labor look like between you and Brittany? It’s one-to-one, we’re equal partners. That was very nice; when Brittany said she wanted to work together she said she only wanted to do it with an equal partner, which was exactly what I was looking for. We both discuss and own fundraising; we both push each other on writing. We both work with our portfolio companies all the time. The classic example is Company A needs something, and one of us will say, “Oh, I have that in my wheelhouse,” or “I’ve worked with previous companies that had similar hurdles” – we try to bring the two brains and experiences together to really help the portfolio succeed. We spoke earlier about innovation in venture – I’ve recently become interested in equity crowdfunding. For someone who has been in the funding ecosystem both on the angel side and now on the institutional capital side, how do you think about equity crowdfunding as an alternative for companies? I think seed rounds are small enough they can be done with private capital, especially with things that we’re looking at. When I was looking at my next move from New York Angels, I actually met with an equity crowdfunding company that wanted me to join their team. I really liked their team, they’re fantastic. But when I talked to my network – which was so important to me because I’m not just bringing my talent and my skill to any job, but also my network – the response from the market wasn’t positive. It wasn’t negative either, necessarily; it was more to do with the risk of the unknown for a lot of the companies and what would be accessible or how legislation would change around those types of fundings. In general the reaction I saw was that the space was not secure enough. But look, that was a couple of years ago now so it’s old information. The Fountainhead by Ayn Rand. I had never read a book with two characters that had my thoughts the way the characters of Dominqiue and Roarke did, equally. I was so happy and I felt so close to them, I loved having that relationship with those characters. What’s the most underhyped area in entrepreneurship? The problem I have is everyone I talk to is excited about what they’re working on – so really I have to ask, “is anything underhyped?” That’s healthy so long as it’s effective. What’s your one unique take on how the world be different in 10 years time? I don’t know if this is unique, but as more tech gets to be covering people’s work or enhancing people’s work, I believe that people’s work hours should become much more efficient, and if the 40 hour work week could be diminished with people still receiving the amount of wealth they need, it would be an interesting balance to see evolve over the next decade. At the end of the day, people care about their wellbeing from a health standpoint and their livelihood. You get both covered with resources from work, both coverage and being able to make money. People want to get back to things that matter to them and make them feel valuable, and that comes in the form of work, but when work becomes more and more automated there will be other types of work, and people need time for that, people should get more of their time back – that’s what I want to see.